The evolving demands of the labour market, coupled with a policy push toward the creation of a ‘Knowledge Economy’, has led to the increasing expectation and prerequisite of a third level degree in the Irish jobs market. With the majority of Irish students pursuing a third level education on completion of second level, second level education itself has been moulded away from one that included both vocational and comprehensive strands, to one that can best be described as a pathway to further education rather than an end in itself. It is therefore not surprising that Ireland boasts one of the highest rates of progression to third level education in Europe, with over 6% of the adult population enrolled in higher education at the present time. While the overall numbers are impressive, a less rosy picture emerges when one observes the geographic and socio-economic demarcations that emerge when one looks at those who progress to third level versus those who do not. These disparities are evident across the state, with Galway and Mayo exhibiting progression levels above the national average, while counties such as Donegal and Laois show the lowest progression rates by county. 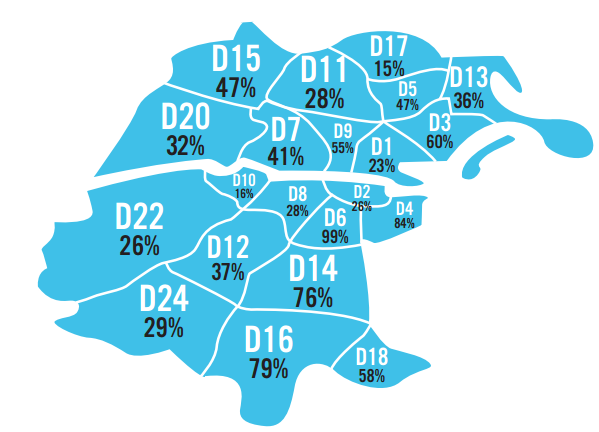 Even more striking than the national differences is the urban stratification of third level progression exhibited in Dublin, where socio-economically affluent regions such as Dublin 6 and Dublin 4 boast third level progression levels up to 99%, while more traditionally working class regions such as Dublin 17 exhibit progression levels of just 15%. The map above is a geographic illustration of what statistical evidence has shown for decades – that third level uptake remains low among socio-economically disadvantaged communities, and reaches near universality among students from higher socio-economic backgrounds. French sociologist Raymond Boudon (1974) categorised class differentials in educational attainment into distinct ‘primary’ and ‘secondary’ effects. Primary effects are those differences that, for genetic or socio-cultural reasons, are expressed via the association between a student’s class background and their level of academic performance. Secondary effects relate to the choices that children from different class backgrounds make, given the options their previous performance allows them to take (Jackson et al., 2007). Secondary effects seek to explain why, all things being equal, students from lower socio-economic classes are more likely to choose not to progress to third level education, while their counterpart with the same academic performance in second level education but from a higher socio-economic background will pursue third level education. While primary effects may to some extent explain the geographic differences observed in third level progression rates between regions such as Dublin 6 and Dublin 17, the scale of the difference and the 99% third level take up rate in Dublin 6 would also indicate that secondary effects has a major role in dictating progression rates, with the difference too large to be simply put down to cognitive ability (for more on the role of social class in Ireland dictating choices in education, see Smyth and Banks 2012 and Smyth 2017). Much has and can be written on how secondary effects skew third level progression toward more affluent students – a subject for future articles. Yet this article’s primary aim is not to explain the development of socio-economic divisions in third level progression rates, but rather question whether the current third level funding model is the most equitable and efficient use of public resources, given that the third level education system is still more likely to cater for those from more affluent backgrounds. Part of the philosophy behind abolishing third level fees in the first instance was to make further education more accessible to those from socio-economically disadvantaged backgrounds. Yet the abolishment of fees does not withdraw all of the significant costs associated with further education, be they direct such as transportation and accommodation costs or indirect such as earnings forgone, whose relative price is highest for those with the least finances. The cost of three to four years of full time education can make third level education too costly for individuals from socio-economically disadvantaged backgrounds to consider it to be a viable option, even where fees are waived. Indeed, while abolishing fees does not necessarily make further education more accessible to students of lesser means, there is evidence to suggest that the absence of fees and the revenue they provide can actually lock less affluent students out of further education. While Scotland has steadfastly maintained free fees in contrast to the rest of the UK, it now holds the greatest disparity in socio-economic class progression to third level in the UK. In order to fund free university places, other sacrifices have been needed such as cutting the maintenance grant available to poorer students, resulting in students from more socio-economically disadvantaged backgrounds graduating with larger debts than their more affluent peers. The disproportionate negative effect free fees hold for poorer Scottish students is merely an illustration of a universal truth – that public subsidisation of non-compulsory further education benefits the upper and middle-classes at least as much as the poor, and indeed progression rates from second level to third level would appear to indicate that they benefit more than the poor (Goodin and Le Grand, 1987). Unless in the rare case that a commodity is consumed less as incomes rise, the better off are more likely to purchase more of a commodity as their incomes rise when compared to those with less buying power. Where these commodities are heavily subsidised by the public purse as in the case of tertiary education, the financially better off are therefore consuming more of the subsidy. The lack of fee revenue entails that the majority of state funding for universities goes into covering fee costs, with result that universities are left chronically underfunded and unable to expand, leading to strict limits on the number of students universities are able to take. This increases competition for limited university places, having a disproportionately negative effect for students from less affluent backgrounds who are less likely to achieve the best secondary school results (on account of primary effects). This is indeed the case in Scotland, where increased competition for university places is leading to many students starting higher education in further education colleges instead, with 20.3% of Scottish students starting their higher education in a FE college in 2013/14 and 34.1% going straight to university, while the comparative English figures are 6% and 40.6% respectively. This competition for university places is further exacerbated by the need for universities to raise revenue by enrolling students who do pay fees (non-EU domiciled students and non-Scottish UK students) – something that is being done to the extent that Scottish students are now the minority in the four most prestigious ‘ancient’ universities of Aberdeen, St Andrews, Edinburgh and Glasgow. Two of the concerns which should be to the forefront of policy makers future plans is to enable access to third level education to those with the least means, while at the same time maintaining high university standards. It can be argued that by having free third level education in Ireland neither of these goals are being realised, as not only are university standards suffering from the lower finances available to them versus international competitors, but as argued above free-fees do little to facilitate entry for those with lesser resources, with the Scottish example illustrating it can even make university education less egalitarian. By introducing a capped fee and loans system akin to that being used in England, all university students would be charged the marginal cost of their education and would pay back their loans from their subsequent earnings, provided they earn above a certain amount (in England the earning cut-off point is currently set at £21,000) and with outstanding debts written off after a certain period of time (30 years). The savings to the state would then enable it to focus resources towards those who most need assistance in the form of maintenance grants, etc., while also maintaining quality within universities. An alternative to a fees and loans model could be an adaption of the model proposed by Le Grand (Goodin and Le Grand, 1987, pp. 95-101), who looked at funding further education through the introduction of a graduate tax. By deciding to take a place on a designated course with free fees, prospective students would accept a future specified tax obligation on graduation in order to recoup the cost of the education. This would maintain free education, while freeing up resources to be directed at those in need of financial assistance and reinvestment in the underfunded third level institutes. Furthermore, linking the repayments to people’s incomes means that those with low or no earnings will effectively pay less or nothing, enabling people to pursue socially valuable but poorly rewarded careers such as social work. By the state seeking to recover some of the costs of third level education while maintaining access for those of lesser means, the subsidising effect for those with the best resources will be minimised. Furthermore, such a system could be manipulated to encourage applications to careers that service areas of the economy that are undermanned. For instance, the Irish public service is currently experiencing a shortage of nurses, with graduate nurses in Ireland often moving to the UK for work after completing their education in Irish subsidised universities. This is proving to be a massive cost for the Irish system, yet the introduction of fees or a graduate tax could offset this cost. Moreover, fees or a graduate tax could be used as a method of encouraging nurses to remain in Ireland on completion of their education, such as by waiving the graduate tax or writing-off a percentage of the loan repayments for nurses who commit to working in the Irish health system for a set period after graduation. This article has sought to argue that paying for the benefit of further education not only allows for higher quality tuition, but also is the more egalitarian and accessible option to a fully state-funded system. In order to achieve a more equal society, with positive repercussions for the economy and self-realisation, access to further education needs to be opened to all. A system of free-fees risks both underfunding and decreasing places in universities, disproportionately affecting those from lower socio-economic backgrounds. Furthermore, it subsidises those in the best position to pay at the detriment of providing assistance to those who cannot. Individuals with a university education earn multiples of what non-university educated individuals are likely to earn over the course of their career – a fee-system will not remove this benefit, it will just allow more to avail of it. Boudon, R. (1974) Education, Opportunity, and Social Inequality. New York: Wiley. Goodin, R. E. and Le Grand, J. (1987) Not only the Poor: The Middle Class and the Welfare State. London: Allen and Unwin. Jackson, M., Erikson, R., Goldthorpe, J. H. and Yaish, M. (2007) ‘Primary and Secondary Effects in Class Differentials in Educational Attainment’, Acta Sociologica, 50(3), pp. 211-229. Smyth, E. and Banks, J. (2012) ‘‘There was never really any question of anything else’: young people’s agency, institutional habitus and the transition to higher education’, British Journal of Sociology of Education, 33(2), pp. 263-281.